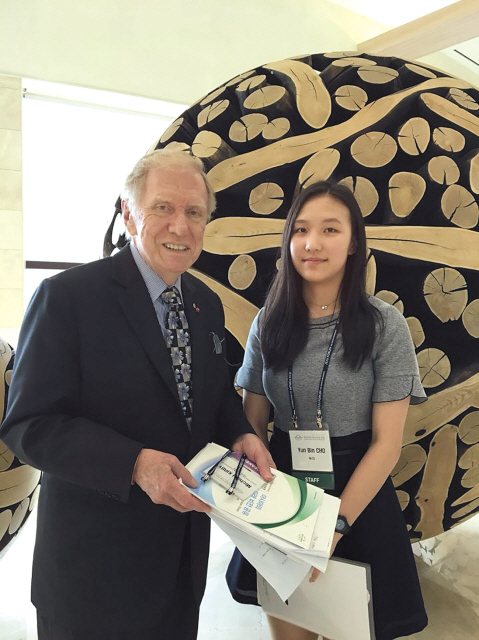 When the librarian at Jeju North London Collegiate School asked Cho Yunbin to be an intern at the 2017 Jeju Peace Forum, Yunbin immediately got to work. The international forum discussing peace on the Korean peninsula brought together some of the biggest political minds - Korean Ministers, international human rights judges, and former US Vice President, Al Gore. Over the course of three days, Yunbin shuttled around attendees and was asked to serve as translator for television interviews of high-profile experts and politicians. She was given the opportunity to play the role of journalist, asking questions of interviewees like the Korean Ambassador to the UN, Mr. Oh Joon, and Australian High Court Judge Michael Kirby. It was, however, her stints at the information desk that left a more immediate mark. There she met artists and politicians from Jeju who impressed upon her Jeju’s significant place in Korean history. As a result, Yunbin started to learn more about the local history, particularly in regards to the Pacific War and WWII. She exhibited her artwork at a Jeju War and Peace Museum event, which was displayed at the Alttre Airfield — a Japanese military base during the Pacific War and a site where many locals were killed. During the exhibition, Yunbin learned the story of the museum director’s father, who was blinded after two years of forced labor by the Japanese in which he was forced to dig underground tunnels. The tunnels, she learned, were dug underneath oreums (small mountains), the very same oruems after which her school’s houses are named. Because the houses are an important part of students’ identity at NLCS, Yunbin felt it important that students learn about local history. She invited the director to give regular talks at the school and became involved in supporting the small museum, which does not attract many tourists. Yunbin made calendars using the paintings displayed at the exhibition to raise funds for the museum, which also does work to preserve historical sites and artifacts from the Pacific War. She also translated the director’s school lectures and is in the process of translating the museum website into English. By distributing multilingual brochures at the Jeju airport, she hopes she can help raise the museum’s profile and bring more visitors to the museum. For Yunbin, knowledge of history plays an important role in fixing the problems of today. The Jeju Peace Forum, whose mission is especially relevant given ongoing peace talks between the Koreas, inspired Yunbin to investigate and promote local history. This, she hopes, may teach us lessons that help us avoid repeating the traumas of the past.